A Compendious Geographical Dictionary containing a Description of Every remarkable Place in Europe, Asia, Africa and America etc (1813) by B.P Capper. East Indies: these are divided into India within the river Ganges and India beyond the river Ganges. This country is situated between the latitudes of 6 and 34 degrees North and between 65 and 91 degrees of East longitude. A great part of this space is covered by the sea. 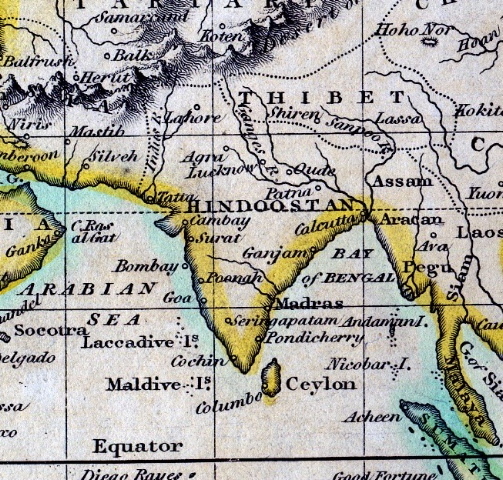 India within the Ganges is bounded on the North by Usbee Tartary and part of Tibet; by the Indian Ocean on the South, by Great Tibet, India Beyond the Ganges, and the Bay of Bengal on the East and by Persia an the India Ocean on the West. The chief mountains are those of Caucasus, Naugracut and Balagate, which runs almost the length of India, from North to South. Many of the mountains produce diamonds, rubies, amethysts and other precious stones. This great country contains inhabitants of various complexions, manners and religions. The manufactures of India are chiefly of muslin, calico and silk. They have some merchant ships of their own and traffic with the countries bordering upon India and particularly with Persia. The Europeans usually purchase most of their manufactures. Is situated between the latitudes of 1 and 30 degrees North and between the longitudes 89 and 109 degrees East. Great parts of these limits is covered by the sea. It is bounded on the North by Tibet and China; by China an the Chinesian Sea on the East by the same sea and the Straits of Malacca on the South and by the Bay of Bengal and part of India on the West. In the north of this country, the air is dry and healthful; but the southern provinces are very hot and moist, especially in the vallies and low lands near the sea and rivers. Use the "Show me" link to locate West Indies on the map. You may need to scroll down to see West Indies highlighted. "What a great traveller you must have been, ma'am!" said Mrs. Musgrove to Mrs. Croft. "Pretty well, ma'am, in the fifteen years of my marriage; though many women have done more. I have crossed the Atlantic four times, and have been once to the East Indies and back again, and only once; besides being in different places about home: Cork, and Lisbon, and Gibraltar. But I never went beyond the Streights, and never was in the West Indies. We do not call Bermuda or Bahama, you know, the West Indies."